For the Dene people native to northern Canada, see Dene. For other uses, see Navajo (disambiguation). The Navajos (/næv.ə.hoʊ/; British English: Navaho, Navajo: Diné or Naabeehó) are a Native American people of the Southwestern United States. The Navajo people are politically divided between two federally recognized tribes, the Navajo Nation and the Colorado River Indian Tribes. At more than 300,000 enrolled tribal members as of 2015[update], the Navajo Nation is the second-largest federally recognized tribe in the U.S. (the Cherokee Nation being the largest) and has the largest reservation in the country. The reservation straddles the Four Corners region and covers more than 27,000 square miles of land in Arizona, Utah and New Mexico. The Navajo language is spoken throughout the region, and most Navajo also speak English. The Navajo are speakers of a Na-Dené Southern Athabaskan language they call Diné bizaad (lit. 'People's language'). The language comprises two geographic, mutually intelligible dialects. The Apache language is closely related to the Navajo language; the Navajo and Apache are believed to have migrated from northwestern Canada and eastern Alaska, where the majority of Athabaskan speakers reside. Speakers of various other Athabaskan languages located in Canada may still comprehend the Navajo language despite the geographic and linguistic deviation of the languages. Additionally, some Navajo speak Navajo Sign Language, which is either a dialect or daughter of Plains Sign Talk. Some also speak Plains Sign Talk itself. Archaeological and historical evidence suggests the Athabaskan ancestors of the Navajo and Apache entered the Southwest around 1400 CE. The Navajo oral tradition is said[by whom?] to retain references to this migration. Until contact with the Pueblo and the Spanish peoples, the Navajo were largely hunters and gatherers. The tribe adopted crop-farming techniques from the Pueblo peoples, growing mainly the traditional "Three Sisters" of corn, beans, and squash. After the Spanish colonists influenced the people, the Navajo began keeping and herding livestock—sheep and goats—as a main source of trade and food. Meat became an essential component of the Navajo diet. 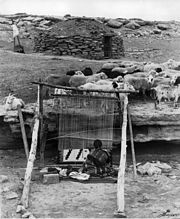 Sheep also became a form of currency and status symbols among the Navajo based on the overall quantity of herds a family maintained. In addition, women began to spin and weave wool into blankets and clothing; they created items of highly valued artistic expression, which were also traded and sold. Oral history indicates a long relationship with Pueblo people and a willingness to incorporate Puebloan ideas and linguistic variance into their culture. There were long-established trading practices between the groups. Spanish records from the mid-16th century recount the Pueblo exchanging maize and woven cotton goods for bison meat, hides, and stone from Athabaskans traveling to the pueblos or living in their vicinity. In the 18th century, the Spanish reported the Navajo maintaining large herds of livestock and cultivating large crop areas. Western historians believe that the Spanish before 1600 referred to the Navajo as Apaches (from the Zuni word for "enemy") or Quechos. 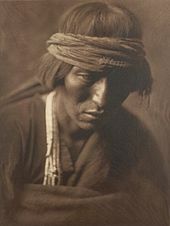 :2–4 Fray Geronimo de Zarate-Salmeron, who was in Jemez in 1622, used Apachu de Nabajo in the 1620s to refer to the people in the Chama Valley region, east of the San Juan River and northwest of present-day Santa Fe, New Mexico. Navahu comes from the Tewa language, meaning a large area of cultivated lands. :7–8 By the 1640s, the Spanish began using the term Navajo to refer to the Diné. During the 1670s, the Spanish wrote that the Diné lived in a region known as Dinétah, about sixty miles (100 km) west of the Rio Chama valley region. In the 1770s, the Spanish sent military expeditions against the Navajo in the Mount Taylor and Chuska Mountain regions of New Mexico. :43–50 The Spanish, Navajo and Hopi continued to trade with each other and formed a loose alliance to fight Apache and Commanche bands for the next twenty years. During this time there were relatively minor raids by Navajo bands and Spanish citizens against each other. In 1800 Governor Chacon led 500 men in an expedition to the Tunicha Mountains against the Navajo. Twenty Navajo chiefs asked for peace. In 1804 and 1805 the Navajo and Spanish mounted major expeditions against each other's settlements. In May 1805 another peace was established. Similar patterns of peace-making, raiding, and trading among the Navajo, Spanish, Apache, Comanche, and Hopi continued until the arrival of Americans in 1846. The Navajo encountered the United States Army in 1846, when General Stephen W. Kearny invaded Santa Fe with 1,600 men during the Mexican–American War. On November 21, 1846, following an invitation from a small party of American soldiers under the command of Captain John Reid, who journeyed deep into Navajo country and contacted him, Narbona and other Navajo negotiated a treaty of peace with Colonel Alexander Doniphan at Bear Springs, Ojo del Oso (later the site of Fort Wingate). This agreement was not honored by some Navajo, nor by some New Mexicans. The Navajo raided New Mexican livestock, and New Mexicans took women, children, and livestock from the Navajo. In 1849, the military governor of New Mexico, Colonel John MacRae Washington—accompanied by John S. Calhoun, an Indian agent—led a force of 400 soldiers into Navajo country, penetrating Canyon de Chelly. He signed a treaty with two Navajo leaders: Mariano Martinez as Head Chief and Chapitone as Second Chief. The treaty acknowledged the transfer of jurisdiction from the United Mexican States to the United States. The treaty allowed forts and trading posts to be built on Navajo land. The United States, on its part, promised "such donations [and] such other liberal and humane measures, as [it] may deem meet and proper." While en route to this treaty signing, Narbona, a prominent Navajo peace leader, was killed, resulting in hostility between the treaty parties. During the next 10 years, the U.S. established forts on traditional Navajo territory. Military records cite this development as a precautionary measure to protect citizens and the Navajo from each other. However, the Spanish/Mexican-Navajo pattern of raids and expeditions continued. Over 400 New Mexican militia conducted a campaign against the Navajo, against the wishes of the Territorial Governor, in 1860–61. They killed Navajo warriors, captured women and children for slaves, and destroyed crops and dwellings. The Navajo call this period Naahondzood, "the fearing time." In 1861, Brigadier-General James H. Carleton, Commander of the Federal District of New Mexico, initiated a series of military actions against the Navajo and Apache. Colonel Kit Carson was at the new Fort Wingate with Army troops and volunteer New Mexico militia. Carleton ordered Carson to kill Mescalero Apache men and destroy any Mescalero property he could find. Carleton believed these harsh tactics would bring any Indian Tribe under control. The Mescalero surrendered and were sent to the new reservation called Bosque Redondo. In the summer of 1863, Carleton ordered Carson to use the same tactics on the Navajo. Carson and his force swept through Navajo land, killing Navajo and destroying crops and dwellings, fouling wells, and capturing livestock. Facing starvation and death, Navajo groups came in to Fort Defiance for relief. On July 20, 1863, the first of many groups departed to join the Mescalero at Bosque Redondo. Other groups continued to come in though 1864. However, not all the Navajo came in or were found. Some lived near the San Juan River, some beyond the Hopi villages, and others lived with Apache bands. Beginning in the spring of 1864, the Army forced around 9,000 Navajo men, women, and children to walk over 300 miles (480 km) to Fort Sumner, New Mexico, for internment at Bosque Redondo. The internment at Bosque Redondo was disastrous for the Navajo, as the government failed to provide an adequate supply of water, wood, provisions, and livestock for the 4,000–5,000 people. Large-scale crop failure and disease were also endemic during this time, as were raids by other tribes and civilians. Some Navajo froze during the winter because they could make only poor shelters from the few materials and resources they were given. This period is known among the Navajo as "The Fearing Time". In addition, a small group of Mescalero Apache, longtime enemies of the Navajos had been relocated to the area. Conflicts resulted. In 1868, the Treaty of Bosque Redondo was negotiated between Navajo leaders and the federal government allowing the surviving Navajo to return to a reservation on a portion of their former homeland. The United States military continued to maintain forts on the Navajo reservation in the years following the Long Walk. Between 1873 and 1895, the military employed Navajo as "Indian Scouts" at Fort Wingate to assist their regular units. During this period, Chief Manuelito founded the Navajo Tribal Police. It operated between 1872 and 1875 as an anti-raid task force working to maintain the peaceful terms of the 1868 Navajo treaty. By treaty, the Navajo were allowed to leave the reservation for trade, with permission from the military or local Indian agent. Eventually, the arrangement led to a gradual end in Navajo raids, as the tribe was able to increase the size of their livestock herds and cultivated crops. In addition, the tribe gained an increase in the size of the Navajo reservation from 3.5 million acres (14,000 km2 (5,400 sq mi)) to the 16 million acres (65,000 km2 (25,000 sq mi)) as it stands today. But economic conflicts with non-Navajos continued for many years as civilians and companies exploited resources assigned to the Navajo. The US government made leases for livestock grazing, took land for railroad development, and permitted mining on Navajo land without consultation with the tribe. In 1883, Lt. Parker, accompanied by 10 enlisted men and two scouts, went up the San Juan River to separate the Navajo and citizens who had encroached on Navajo land. In the same year, Lt. Lockett, with the aid of 42 enlisted soldiers, was joined by Lt. Holomon at Navajo Springs. Evidently, citizens of the surnames Houck and/or Owens had murdered a Navajo chief's son, and 100 armed Navajo warriors were looking for them. In 1887, citizens Palmer, Lockhart, and King fabricated a charge of horse stealing and randomly attacked a dwelling on the reservation. Two Navajo men and all three whites died as a result, but a woman and a child survived. Capt. Kerr (with two Navajo scouts) examined the ground and then met with several hundred Navajo at Houcks Tank. Rancher Bennett, whose horse was allegedly stolen, told Kerr that his horses were stolen by the three whites to catch a horse thief. In the same year, Lt. Scott went to the San Juan River] with two scouts and 21 enlisted men. The Navajos believed Lt. Scott was there to drive off the whites who had settled on the reservation and had fenced off the river from the Navajo. Scott found evidence of many non-Navajo ranches. Only three were active, and the owners wanted payment for their improvements before leaving. Scott ejected them. In 1890, a local rancher refused to pay the Navajo a fine of livestock. The Navajo tried to collect it, and whites in southern Colorado and Utah claimed that 9,000 of the Navajo were on a warpath. A small military detachment out of Fort Wingate restored white citizens to order. In 1913, an Indian agent ordered a Navajo and his three wives to come in, and then arrested them for having a plural marriage. A small group of Navajo used force to free the women and retreated to Beautiful Mountain with 30 or 40 sympathizers. They refused to surrender to the agent, and local law enforcement and military refused the agent's request for an armed engagement. General Scott arrived, and with the help of Henry Chee Dodge, a leader among the Navajo, defused the situation. During the time on the reservation, the Navajo tribe was forced to assimilate to white society. Navajo children were sent to boarding schools within the reservation and off the reservation. The first Bureau of Indian Affairs (BIA) school opened at Fort Defiance in 1870 and led the way for eight others to be established. Many older Navajo were against this education and would hide their children to keep them from being taken. Once the children arrived at the boarding school, their lives changed dramatically. European Americans taught the classes under an English-only curriculum and punished any student caught speaking Navajo. The children were under militaristic discipline, run by the Siláo. In multiple interviews, subjects recalled being captured and disciplined by the Siláo if they tried to run away. Other conditions included inadequate food, overcrowding, required manual labor in kitchens, fields, and boiler rooms; and military-style uniforms and haircuts. Change did not occur in these boarding schools until after the Meriam Report was published in 1929 by the Secretary of Interior, Hubert Work. This report discussed Indian boarding schools as being inadequate in terms of diet, medical services, dormitory overcrowding, undereducated teachers, restrictive discipline, and manual labor by the students to keep the school running. This report was the precursor to education reforms initiated under President Franklin D. Roosevelt, under which two new schools were built on the Navajo reservation. But Rough Rock Day School was run in the same militaristic style as Fort Defiance and did not implement the educational reforms. The Evangelical Missionary School was opened next to Rough Rock Day School. Navajo accounts of this school portray it as having a family-like atmosphere with home-cooked meals, new or gently used clothing, humane treatment, and a Navajo-based curriculum. Educators found the Evangelical Missionary School curriculum to be much more beneficial for the Navajo children. In 1937, Mary Cabot Wheelright and Hastiin Klah, an esteemed and influential Navajo singer or medicine man, founded the Wheelwright Museum of the American Indian in Santa Fe. It is a repository for sound recordings, manuscripts, paintings, and sandpainting tapestries of the Navajos. It also featured exhibits to express the beauty, dignity, and logic of Navajo religion. When Klah met Cabot in 1921, he had witnessed decades of efforts by the US government and missionaries to assimilate the Navajos into mainstream society. The museum was founded to preserve the religion and traditions of the Navajo, which Klah was sure would otherwise soon be lost forever. The Navajo Livestock Reduction was imposed upon the Navajo Nation by the federal government starting in the 1933, during the Great Depression. Under various forms it continued into the 1950s. Worried about large herds in the arid climate, at a time when the Dust Bowl was endangering the Great Plains, the government decided that the land of the Navajo Nation could support only a fixed number of sheep, goats, cattle, and horses. The Federal government believed that land erosion was worsening in the area and the only solution was to reduce the number of livestock. In 1933, John Collier was appointed commissioner of the BIA. In many ways, he worked to reform government relations with the Native American tribes, but the reduction program was devastating for the Navajo, for whom their livestock was so important. The government set land capacity in terms of "sheep units". In 1930 the Navajo grazed 1,100,000 mature sheep units. These sheep provided half the cash income for the individual Navajo. Collier's solution was to first launch a voluntary reduction program, which was made mandatory two years later in 1935. The government paid for part of the value of each animal, but it did nothing to compensate for the loss of future yearly income for so many Navajo. 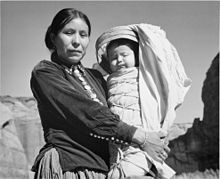 In the matrilineal and matrilocal world of the Navajo, women were especially hurt, as many lost their only source of income with the reduction of livestock herds. The Navajo did not understand why their centuries-old practices of raising livestock should change. They were united in opposition but they were unable to stop it. Historian Brian Dippie notes that the Indian Rights Association denounced Collier as a 'dictator' and accused him of a "near reign of terror" on the Navajo reservation. Dippie adds that, "He became an object of 'burning hatred' among the very people whose problems so preoccupied him." The long-term result was strong Navajo opposition to Collier's Indian New Deal. Many Navajo young people moved to cities to work in urban factories in World War II. Many Navajo men volunteered for military service in keeping with their warrior culture, and they served in integrated units. The War Department in 1940 rejected a proposal by the BIA that segregated units be created for the Indians. The Navajo gained firsthand experience with how they could assimilate into the modern world, and many did not return to the overcrowded reservation, which had few jobs. Four hundred Navajo code talkers played a famous role during World War II by relaying radio messages using their own language. The Japanese were unable to understand or decode it. In the 1940s, large quantities of uranium were discovered in Navajo land. From then into the early 21st century, the U.S. allowed mining without sufficient environmental protection for workers, waterways, and land. The Navajo have claimed high rates of death and illness from lung disease and cancer resulting from environmental contamination. Since the 1970s, legislation has helped to regulate the industry and reduce the toll, but the government has not yet offered holistic and comprehensive compensation. Dibé (sheep) remain an important aspect of Navajo culture. The name "Navajo" comes from the late 18th century via the Spanish (Apaches de) Navajó "(Apaches of) Navajó", which was derived from the Tewa navahū "fields adjoining a ravine". The Navajos call themselves Diné. Like other Apacheans, the Navajos were semi-nomadic from the 16th through the 20th centuries. Their extended kinship groups had seasonal dwelling areas to accommodate livestock, agriculture, and gathering practices. As part of their traditional economy, Navajo groups may have formed trading or raiding parties, traveling relatively long distances. Historically, the structure of the Navajo society is largely a matrilineal system, in which the family of the women owned livestock, dwellings, planting areas and livestock grazing areas. Once married, a Navajo man would move to live with his bride in her dwelling and near her mother's family. Daughters (or, if necessary, other female relatives) were traditionally the ones who received the generational property inheritance. Children are "born to" and belong to the mother's clan, and are "born for" the father's clan. The mother's eldest brother has a strong role in her children's lives. As adults, men represent their mother's clan in tribal politics. Those who practice the Navajo religion regard the hogan as sacred. The religious song "The Blessingway" (hózhǫ́ǫ́jí) describes the first hogan as being built by Coyote with help from Beavers to be a house for First Man, First Woman, and Talking God. The Beaver People gave Coyote logs and instructions on how to build the first hogan. Navajos made their hogans in the traditional fashion until the 1900s, when they started to make them in hexagonal and octagonal shapes. Hogans continue to be used as dwellings, especially by older Navajos, although they tend to be made with modern construction materials and techniques. Some are maintained specifically for ceremonial purposes. Navajo spiritual practice is about restoring balance and harmony to a person's life to produce health and is based on the ideas of Hózhóójí. The Diné believed in two classes of people: Earth People and Holy People. The Navajo people believe they passed through three worlds before arriving in this world, the Fourth World or the Glittering World. As Earth People, the Diné must do everything within their power to maintain the balance between Mother Earth and man. The Diné also had the expectation of keeping a positive relationship between them and the Diyin Diné. In the Diné Bahane' (Navajo beliefs about creation), the First, or Dark World is where the four Diyin Diné lived and where First Woman and First Man came into existence. Because the world was so dark, life could not thrive there and they had to move on. The Second, or Blue World, was inhabited by a few of the mammals Earth People know today as well as the Swallow Chief, or Táshchózhii. The First World beings had offended him and were asked to leave. From there, they headed south and arrived in the Third World, or Yellow World. The four sacred mountains were found here, but due to a great flood, First Woman, First Man, and the Holy People were forced to find another world to live in. This time, when they arrived, they stayed in the Fourth World. In the Glittering World, true death came into existence, as well as the creations of the seasons, the moon, stars, and the sun. The Holy People, or Diyin Diné, had instructed the Earth People to view the four sacred mountains as the boundaries of the homeland (Dinétah) they should never leave: Blanca Peak (Sisnaajiní — Dawn or White Shell Mountain) in Colorado; Mount Taylor (Tsoodził — Blue Bead or Turquoise Mountain) in New Mexico; the San Francisco Peaks (Dookʼoʼoosłííd — Abalone Shell Mountain) in Arizona; and Hesperus Mountain (Dibé Nitsaa — Big Mountain Sheep) in Colorado. Times of day, as well as colors, are used to represent the four sacred mountains. Throughout religions, the importance of a specific number is emphasized and in the Navajo religion, the number four appears to be sacred to their practices. For example, there were four original clans of Diné, four colors and times of day, four Diyin Diné, and for the most part, four songs sung for a ritual. The ceremonial leader proceeds by asking the Holy People to be present in the beginning of the ceremony, then identifying the patient with the power of the spirit-being, and describing the patient's transformation to renewed health with lines such as, "Happily I recover." Ceremonies are used to correct curses that cause of some illnesses or misfortunes. People may complain of witches who do harm to the minds, bodies, and families of innocent people., though these matters are rarely discussed in detail with those outside of the community. 19th-century Navajo jewelry with the popular concho and dragonfly designs. Silversmithing is an important art form among Navajos. Atsidi Sani (c. 1830–c. 1918) is considered to be the first Navajo silversmith. He learned silversmithing from a Mexican man called Nakai Tsosi ("Thin Mexican") around 1878 and began teaching other Navajos how to work with silver. By 1880, Navajo silversmiths were creating handmade jewelry including bracelets, tobacco flasks, necklaces and bracers. Later, they added silver earrings, buckles, bolos, hair ornaments, pins and squash blossom necklaces for tribal use, and to sell to tourists as a way to supplement their income. The Navajos' hallmark jewelry piece called the "squash blossom" necklace first appeared in the 1880s. The term "squash blossom" was apparently attached to the name of the Navajo necklace at an early date, although its bud-shaped beads are thought to derive from Spanish-Mexican pomegranate designs. The Navajo silversmiths also borrowed the "naja" (najahe in Navajo) symbol to shape the silver pendant that hangs from the "squash blossom" necklace. Turquoise has been part of jewelry for centuries, but Navajo artists did not use inlay techniques to insert turquoise into silver designs until the late 19th century. Navajos came to the southwest with their own weaving traditions; however, they learned to weave cotton on upright looms from Pueblo peoples. The first Spaniards to visit the region wrote about seeing Navajo blankets. By the 18th century the Navajos had begun to import Bayeta red yarn to supplement local black, grey, and white wool, as well as wool dyed with indigo. 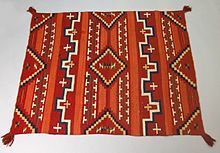 Using an upright loom, the Navajos made extremely fine utilitarian blankets that were collected by Ute and Plains Indians. These Chief's Blankets, so called because only chiefs or very wealthy individuals could afford them, were characterized by horizontal stripes and minimal patterning in red. 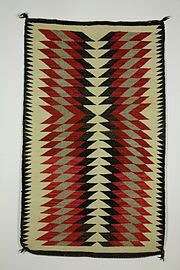 First Phase Chief's Blankets have only horizontal stripes, Second Phase feature red rectangular designs, and Third Phase feature red diamonds and partial diamond patterns. The completion of the railroads dramatically changed Navajo weaving. Cheap blankets were imported, so Navajo weavers shifted their focus to weaving rugs for an increasingly non-Native audience. Rail service also brought in Germantown wool from Philadelphia, commercially dyed wool which greatly expanded the weavers' color palettes. Some early European-American settlers moved in and set up trading posts, often buying Navajo rugs by the pound and selling them back east by the bale. The traders encouraged the locals to weave blankets and rugs into distinct styles. These included "Two Gray Hills" (predominantly black and white, with traditional patterns); Teec Nos Pos (colorful, with very extensive patterns); "Ganado" (founded by Don Lorenzo Hubbell), red-dominated patterns with black and white; "Crystal" (founded by J. B. Moore); oriental and Persian styles (almost always with natural dyes); "Wide Ruins", "Chinlee", banded geometric patterns; "Klagetoh", diamond-type patterns; "Red Mesa" and bold diamond patterns. Many of these patterns exhibit a fourfold symmetry, which is thought to embody traditional ideas about harmony or hózhǫ́. In 2000 the documentary The Return of Navajo Boy was shown at the Sundance Film Festival. It was written in response to an earlier film, The Navajo Boy which was somewhat exploitative of those Navajos involved. The Return of Navajo Boy allowed the Navajos to be more involved in the depictions of themselves. In the final episode of the third season of the FX reality TV show 30 Days, the show's producer Morgan Spurlock spends thirty days living with a Navajo family on their reservation in New Mexico. The July 2008 show called "Life on an Indian Reservation", depicts the dire conditions that many Native Americans experience living on reservations in the United States. Tony Hillerman wrote a series of detective novels whose detective characters were members of the Navajo Tribal Police. The novels are noted for incorporating details about Navajo culture, and in some cases expand focus to include nearby Hopi and Zuni characters and cultures, as well. Four of the novels have been adapted for film/TV. His daughter has continued the novel series after his death. General Douglas MacArthur meeting Navajos, Pima, Pawnee and other Native American troops. 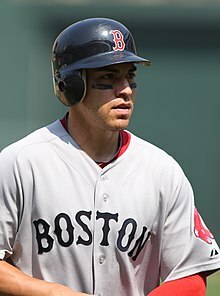 Jacoby Ellsbury, pictured in a Boston Red Sox uniform, is a Navajo (from his mother's side) baseball player for the New York Yankees. James and Ernie, a Navajo comedy duo and actors. Chester Nez, was the last original Navajo code talker who served in the United States Marine Corps during World War II. Henry Chee Dodge, first Navajo Chairman and modern Navajo leader, (1922–1928, 1942–1946). Chris Deschene – veteran, an attorney, an engineer, and a community leader. One of few Native Americans to be accepted into the U.S. Naval Academy in Annapolis. Upon graduation, he was commissioned as a 2nd Lt. in the U.S. Marine Corps. He made an unsuccessful attempt to run for Navajo Nation President. Peterson Zah – the first Navajo President and the last Chairman of the Navajo Nation. ^ "Arizona's Native American Tribes: Navajo Nation." Archived 2012-01-01 at the Wayback Machine University of Arizona, Tucson Economic Development Research Program. Retrieved 19 Jan 2011. ^ For example, the Great Canadian Parks website suggests the Navajo may be descendants of the lost Naha tribe, a Slavey tribe from the Nahanni region west of Great Slave Lake. "Nahanni National Park Reserve". Great Canadian Parks. Retrieved 2007-07-02. ^ a b c d Correll, J. Lee (1976). Through White Men's Eyes: A contribution to Navajo History (Book)|format= requires |url= (help). Window Rock, AZ: The Navajo Times Publishing Company. ^ Thompson, Gerald (1976). The Army and the Navajo: The Bosque Redondo Reservation Experiment 1863–1868. Tucson, Arizona: The University of Arizona Press. ISBN 9780816504954. ^ a b Compiled (1973). Roessel, Ruth, ed. Navajo Stories of the Long Walk Period. Tsaile, Arizona: Navajo Community College Press. ISBN 0-912586-16-8. ^ George Bornstein, "The Fearing Time: Telling the tales of Indian slavery in American history", Times Literary Supplement, 20 October 2017 p. 29 (review of Andrés Reséndez, The Other Slavery: The Uncovered Story of Indian Enslavement in America, Houghton Mifflin Harcourt, ISBN 9780547640983). ^ Kerr, "February 18, 1887 letter to Acting Assistant General," District of New Mexico, National Archive Materials, Navajo Tribal Museum, Window Rock, Arizona. ^ a b McCarty, T.L. ; Bia, Fred (2002). A Place to be Navajo: Rough Rock and the Struggle for Self-Determination in Indigenous Schooling. Mahwah, NJ: Lawrence Erlbaum Associates. p. 42. ISBN 0-8058-3760-4. ^ McCarty, T.L. ; Bia, Fred (2002). A Place to be Navajo: Rough Rock and the Struggle for Self-Determination in Indigenous Schooling. Mahwah, NJ: Lawrence Erlbaum Associates. pp. 44–5. ISBN 0-8058-3760-4. ^ McCarty, T.L. ; Bia, Fred (2002). A Place to be Navajo: Rough Rock and the Struggle for Self-Determination in Indigenous Schooling. Mahwah, NJ: Lawrence Erlbaum Associates. p. 48. ISBN 0-8058-3760-4. ^ McCarty, T.L. ; Bia, Fred (2002). A Place to be Navajo: Rough Rock and the Struggle for Self-Determination in Indigenous Schooling. Mahwah, NJ: Lawrence Erlbaum Associates. pp. 50–1. ISBN 0-8058-3760-4. ^ Peter Iverson, Dine: A History of the Navajos, 2002, University of New Mexico Press, Chapter 5, "our People Cried": 1923–1941. ^ a b Compiled (1974). Roessel, Ruth, ed. Navajo Livestock Reduction: A National Disgrace. Tsaile, Arizona: Navajo Community College Press. ISBN 0-912586-18-4. ^ Peter Iverson (2002). "For Our Navajo People": Diné Letters, Speeches & Petitions, 1900-1960. U of New Mexico Press. p. 250. ^ Richard White, ch 13: "The Navajos become Dependent" (1988). The Roots of Dependency: Subsistence, Environment, and Social Change Among the Choctaws, Pawnees, and Navajos. U of Nebraska Press. pp. 300ff. ^ Donald A. Grinde Jr, "Navajo Opposition to the Indian New Deal." Integrated Education (1981) 19#3–6 pp: 79–87. ^ Judy Pasternak, Yellow Dirt- An American Story of a Poisoned Land and a People Betrayed, Free Press, New York, 2010. ^ a b Kluckholm, Clyde; Leighton, Dorothea (1974). The Navaho. Cambridge, Massachusetts: Harvard University Press. ISBN 0-674-6060-3-5. ^ a b "Navajo Cultural History and Legends". www.navajovalues.com. Retrieved 2016-05-31. ^ "The Story of the Emergence". www.sacred-texts.com. Retrieved 2016-05-31. ^ a b "Navajo Culture". www.discovernavajo.com. Retrieved 2016-05-31. ^ a b c Wyman, Leland (1983). "Navajo Ceremonial System" (PDF). Smithsonian Institution. Retrieved 31 May 2016. ^ Kluckhohn, Clyde (1967). Navaho Witchcraft. Boston: Beacon Press. 080704697-3. ^ Keene, Dr. Adrienne, "Magic in North America Part 1: Ugh." at Native Appropriations", 8 March 2016. Accessed 9 April 2016: "What happens when Rowling pulls this in, is we as Native people are now opened up to a barrage of questions about these beliefs and traditions ... but these are not things that need or should be discussed by outsiders. At all. I'm sorry if that seems "unfair," but that's how our cultures survive." ^ "Synopsis". navajoboy.com. Archived from the original on February 8, 2009. Retrieved 2009-02-26. ^ "Klee Benally". Nativenetworks.si.edu. Retrieved 2012-01-31. Adair, John. The Navajo and Pueblo Silversmiths. Norman: Oklahoma Press, 1989. ISBN 978-0-8061-2215-1. Iverson, Peter, Jennifer Nez Denetdale, and Ada E. Deer. The Navajo. New York: Chelsea House Publishers, 2006. ISBN 0-7910-8595-3. Kehoe, Alice Beck. North American Indians: A Comprehensive account. Upper Saddle River, NJ: Prentice-Hall, 2005. Newcomb, Franc Johnson (1964). Hosteen Klah: Navajo Medicine Man and Sand Painter. Norman, Oklahoma: University of Oklahoma Press. LCCN 64020759. Sandner, Donald. Navaho symbols of healing: a Jungian exploration of ritual, image, and medicine. Rochester, VT: Healing Arts Press, 1991. ISBN 978-0-89281-434-3. Bailey, L. R. (1964). The Long Walk: A History of the Navaho Wars, 1846–1868. Bighorse, Tiana (1990). Bighorse the Warrior. Ed. Noel Bennett, Tucson: University of Arizona Press. Clarke, Dwight L. (1961). Stephen Watts Kearny: Soldier of the West. Norman, Oklahoma: University of Oklahoma Press. Downs, James F. (1972). The Navajo. New York: Holt, Rinehart, and Winston. Left Handed (1967) . Son of Old Man Hat. recorded by Walter Dyk. Lincoln, Nebraska: Bison Books & University of Nebraska Press. LCCN 67004921. Forbes, Jack D. (1960). Apache, Navajo and Spaniard. Norman, OK: University of Oklahoma Press. LCCN 60013480. Hammond, George P. and Rey, Agapito (editors) (1940). Narratives of the Coronado Expedition 1540–1542. Albuquerque: University of New Mexico Press. Iverson, Peter (2002). Diné: A History of the Navahos. Albuquerque: University of New Mexico Press. ISBN 0-8263-2714-1. Kelly, Lawrence (1970). Navajo Roundup Pruett Pub. Co., Colorado. McNitt, Frank (1972). Navajo Wars. Albuquerque: University of New Mexico Press. Plog, Stephen Ancient Peoples of the American Southwest. Thames and London, LTD, London, England, 1997. ISBN 0-500-27939-X. Roessel, Ruth (editor) (1973). Navajo Stories of the Long Walk Period. Tsaile, Arizona: Navajo Community College Press. Roessel, Ruth, ed. (1974). Navajo Livestock Reduction: A National Disgrace. Tsaile, Arizona: Navajo Community College Press. ISBN 0-912586-18-4. Voyles, Traci Brynne (2015). Wastelanding: Legacies of Uranium Mining in Navajo Country. Minneapolis, MN: University of Minnesota Press. Witherspoon, Gary (1977). Language and Art in the Navajo Universe. Ann Arbor: University of Michigan Press. Zaballos, Nausica (2009). Le système de santé navajo. Paris: L'Harmattan. Herbermann, Charles, ed. (1913). 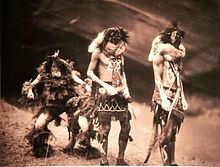 "Navajo Indians" . Catholic Encyclopedia. New York: Robert Appleton Company.